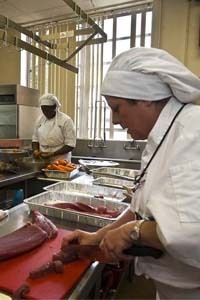 Tidewater Community College culinary students are catering an April 22 event for Temple Israel, celebrating rabbi Michael Panitz’s 20th anniversary with the synagogue. Deanna Freridge’s American Regional Cuisine class (HRI 207) is preparing dinner for 300 – an excellent learning opportunity for the novice chefs. But making the challenge even more special – all the food must be prepared under kosher supervision. Among the menu offerings: panko-crusted salmon cakes served with Dijon dill dipping sauce, mini sesame tuna skewers served with wasabi cream sauce, both hors d’oeuvres, and herb roasted Cornish hen, wild rice and sweet potato stuffing and julienne carrots in a yellow squash ring, part of the plated entrée. In addition, students from Freridge’s Food & Beverage Dining Room Service class (HRI 134) were in charge of setup for the entire room – 25 tables of 12 guests each, complete with salad bowls, plates, water and wine glasses and proper place settings. Ensuring the preparation is kosher is a lesson in itself. Generally, all of Freridge’s students work with their own set of knives. Cooking kosher requires them to work with only the equipment in the Temple Israel upstairs kitchen, as separate utensils are used for meat and dairy. Special care also went into shopping for the event to ensure that all ingredients are kosher, everything from150 hens to 42 pounds of tuna to 25 pounds of breadcrumbs. Proper technique is essential. Freridge demonstrates everything that must be done before turning the reins over to her students. The Cornish hens are the most daunting. Freridge shows how to remove the thigh before boning the meat from the breast using a “cut and pull” technique and ultimately rolls each into a snug little ball that solidifies during cooking. “We want to make sure we make the proper cuts and don’t lose the meat on the carcass,” she said. Tuna – all 700 chunks – needs to be uniform in size. Carrots are sliced just so. Everything made is accounted for with meticulous precision. Students constantly label and count, so portion size is consistent. Teaching assistant Ralph Flores, graduating in December, says catering a real-life event in real time is rewarding, and the fact that the students are learning kosher techniques is invaluable.